Hello. I am from Turkey and I am using wordpress web side. I added TubePress Plugin but it is English. I want to change some words. What can I do? TubePress does have translations available and is always happy to receive more translations, if you would care to contribute? If you would like a Turkish translation and you are willing to contribute, please let us know and I will have the developer contact you. Otherwise, you will need to edit the playertype.tpl.php page, where 'playertype' is the player you choose to use, such as youtube, default, vimeo, etc. and then find the words you wish to change. Thanks for your reply. I am willing to contribute. my e-mail adress <redacted> please contact with me. N ow I want to learn this C an I change the display english words "category entertainment ..."
The words within 'single quotes' are what display on your page with your TubePress gallery. I have contacted our developer asking them to get in touch with you regarding assistance in translating TubePress into Turkish. I applied your instructions but some problems. There are some alpha numeric characters in Turkish as "ş ğ ü ı ö" which are not in English. I think maybe we change another things? I think may be meta UTF-8 to ISO-5589-9? I think pictures are more explanatory. 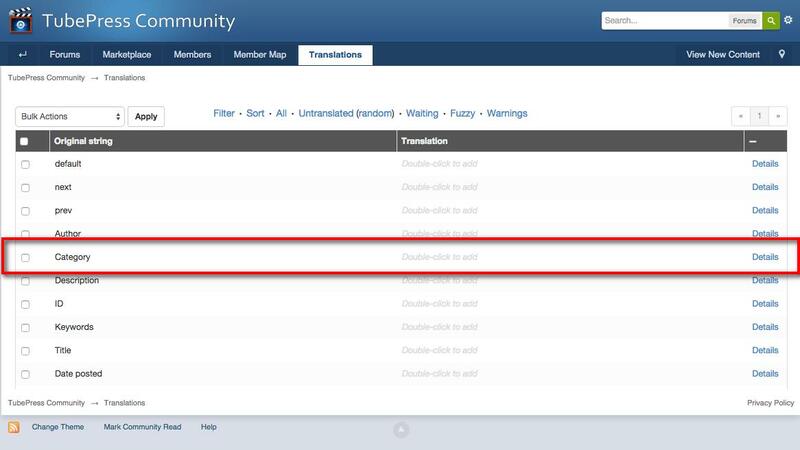 The official means of adding new translations is to use the "Translations" tab here on community.tubepress.com (screenshot). Logged-in users can contribute translations to TubePress directly from their web browser. For instance, you can translate the English word "Category" into Turkish by double-clicking the appropriate row (screenshot) and typing in the translation. Once you've added your translations, we can supply you with an updated copy of TubePress for immediate use until the next official release of TubePress. Does that make sense? Please also note as a token of appreciate we give account credit to all translators. With it you may purchase TubePress Pro or any of our add-ons. Yes that makes sense me. I will be glad. Now, I will translate words to Turkish. And I hope everyone can benefit. I translated words to Turkish, but I have to try and see words in software. For example, "Video %s not found" and "order videos by". I want to see where they are in software. I am waiting for your reply. I added Turkish words, but anyone return to me. Thank you for translating into Turkish. The phrases above are used at various times within TubePress. Could be an error message because the Vimeo or YouTube API couldn't find a specific video that was being searched for. I finished now all customizing in translate. I exported "all current" "portable object message catalog(.po)" and "machine object message catalog(.mo)". I installed them and send to "plugins/tubepress/src/main/resources/i18n"
But there is any change. TubePress should use whatever the default language is set to within your WordPress, as long as it has the .po and .mo files in the proper location, which it seems you have them in. Have you tried disabling and then re-enabling TubePress? These screen images are .po , .mo and web side screen. And my wordpress web side is Turkish as default language. And I tried disablig and then re-enabling tubepress but the 3.rd screen image. "View Count" is not Turkish. I have asked our developer to look into this as I am not quite sure why it is not working properly.